The Bitty Twins dolls are always on the go! They're 15 inches tall, with cuddly cloth bodies, smooth vinyl limbs, and hair that can be styled.These toddlers are twins—and best friends! Together, they open up a world of imagination. American Girl creates the most precious doll's that correspond with the American Girl Storybooks. Each American Girl has her own story line to follow. A while ago I introduced the princess to some of the book's from the American Girl collection, I read them with her at bed time frequently and she absolutely loves them. So, you can imagine how over the moon excited she was when the Bitty Twins arrived! We chose the Twins pictured above because they most resembled her, however there are a variety of other hair and complexion options to choose from. The twins arrive in the most adorable Argyle outfits and each also have on the cutest pair of shoes! The princess and I were absolutely in awe with all of the little details to each the doll's! What I really enjoyed as a mother was the included book " Bitty Twins Learn to Share". Although the princess and B aren't twins they are close enough in age that they experience issues with sharing (toy's, time with dh and myself, etc. 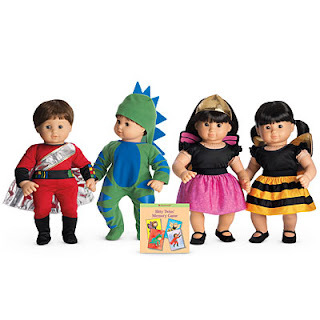 ), and both the book and dolls promote sharing in a way that is relatable for her at a toddler age. The princess loves to put one in the baby carrier, and the other in the stroller and wheel them around the block. It's absolutely wonderful watching her have compassion and taking care of her Bitty Twins; my baby is growing up so fast! The princess is now excited to add to her Bitty Twins wardrobe...she has her eye on the adorable Wings & Things costume set (pictured below) and Pajama set's for each of her dolls. We absolutely love American Girl and all that it stands for! 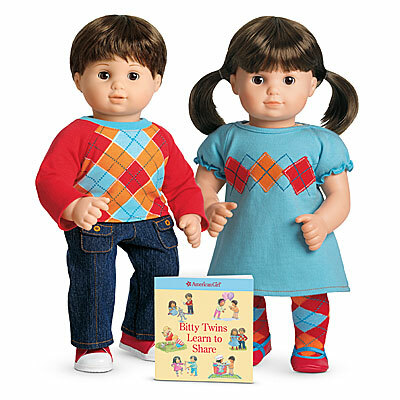 Light up your little one's world this Holiday with the precious Bitty Twins by American Girl! They make the perfect Holiday Gift!